The C-Brats :: - How do you add extra anchor line while on the water. 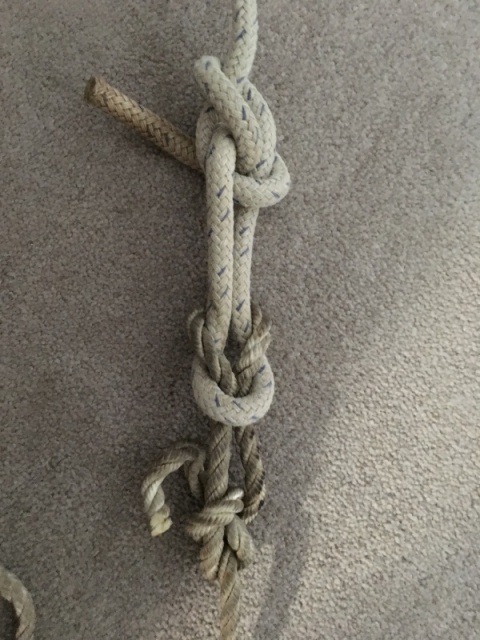 How do you add extra anchor line while on the water. First, the chain link Bob showed works great. I have one and it goes through the windlass (Quick 500) easily, many times. As to anchoring depths, I have not been past Cape Caution, but have considerable time in the Broughtons, some in Desolation, and more in the Gulf and San Juans. I use a Rocna 9 and have 70 feet of chain and rarely let out past the end of the chain. When anchoring, I am usually in pretty shallow water. Tides are generally 10 - 15 feet or less, and most of my anchor spots are where I have about 5 feet under me at low tide. I have been able to do that without a stern tie, and usually have a 5 (to 7) to one scope. I would think there would be places that you could anchor at less that 50 feet almost anywhere within a few miles. Thataway wrote "If you only want a temporary addition, then I would just join the two lines with a bowline in each rope--and interweave the bowlines, with a square knot"
I think I get the interweave bowlines - with rope 1 make a bowline with a loop, run rope 2 through the rope 1 loop and tie a bowline on rope 2 with rope 2's loop around rope 1's working end and then pull the working ends of both ropes and the loops interweave - right?? Where is the square knot? I may have to take a photo--but start by tying one bowline. Then form the loop in the standing part of the line for the second bowline--take the end, and go over the loop in the first bowline, then around behind both parts of the loop, and up and over, to finish the bowline, as you go thru the small loop you made, around the standing part, and back down the "hole" in the loop. Doing this makes much greater contact area of the lines, than just tying the two lines together. Another way is to look at the way a "Sheet bend" is made--but you can make symmetrical loops, as in the "reef knot" or square knot. I'll take a photo tomorrow, if this did not explain it adequately. I did not use equal size lines, just a couple I had lying in the garage, to give some contrast between the double core, and the 3 strand lines. In this case, I tied the bowline in the double core (smooth rope), and then wove the 3 strand up out and around--the standing look in the first bowline, then finished my second bowline. This gives far greater surface area of contact between the ropes, and thus far less potential chafe, or a point of failure in the two loops. Knots are a lot of fun, and will save you and your in many cases. My favorite book of knots is "Ashley Book of Knots" it is over 3/4 of a century old, but still relevant. There are a lot of modern and synthetic ropes, where one has to use other techniques. But one is always learning as they use various knots--as we all do from our C Dorys.